Castle in the Sand is the perfect place to bring your family and friends to enjoy a fabulous Beachfront living experience! Listen to the surf and enjoy the beautiful views of the Pacific Ocean right from the deck. 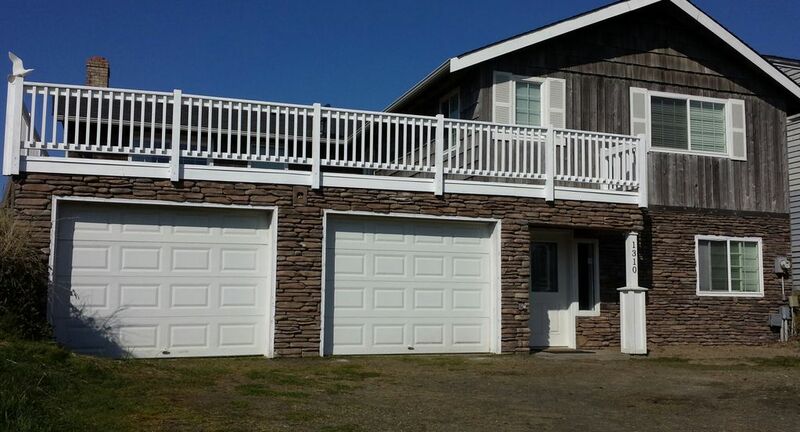 Located in the popular Bayshore community in Waldport, this home truly has something for everyone in the family. Upstairs is great for the adults to set by the fire place or cook a fantastic meal in this fully equipped kitchen with ocean views. The dining room has a large table for the whole family to sit and enjoy meals together with more ocean views! Downstairs you will find a Large Flat Screen TV with WiFi capable Blu ray Player with tons of streaming apps including free Netflix and Pandora. There is also a pool table, board games and puzzles for all ages to enjoy. Step outside off the deck onto 6 miles of walkable sandy beaches. This home sleeps 12, is dog friendly, with WI-FI and DSL. There is a fireplace upstairs and a wood burning stove downstairs for those stormy cold nights. Once you have stayed at the “Castle in the Sand”, you will come back for years to come! Lower level features a pool table,game closet, Flat Screen TV, WiFi capable Blu ray Player with tons of apps including free Netflix and Pandora, and hide-a-bed couch. Summer months: Pool access with daily fee and rental agreement. We are 2 couples that bought this home. It was a dream of all of ours to own a beachfront home. With our combined skills we went through and completely updated the home ourselves. It took about 6 months every weekend to make it happen. We ate a lot of frozen pizzas and fell in love with the hamburgers at Vicki's Big Wheel Drive. We both own a dog so it made sense to have our home open to other dogs. They absolutely love this place! Max can��t wait to run on the beach then take a dip in the cool ocean & Hiroshi can’t dig enough. They sleep like little puppies when we get back to the house. We hope you get a chance to enjoy our home as much as we have. Waldport is such a quiet, tranquil town. It just seemed like the perfect location. This is the most relaxing place we can think of being. We stay away in the summer so you all can enjoy it as much as possible. We��re surprised at how nice the weather can be in the winter when we go. Nothing better than sitting by the fire watching the surf. I can’t emphasize enough how awesome it is to have the pool table separate from the main living area! We usually have kids with us and they have no desire to be with the adults because they have a big T.V., pool table & stereo all downstairs. It is impossible to feel crowded. There is seating for 12 at the dining table so everyone enjoys just hanging out together. When you feel like going to the beach it is right out the door. Perfect set up for families and extras.Nice large table and plenty of room in the kitchen for helping hands.First time I have been able to put everything for the kitchen that I brought away with all the kitchen storage. Thanks for a great stay. We had an absolutely wonderful time in this beautiful home. We had 12 family members in this home and several others came to visit for birthday cake. It was spacious and comfortable. Wonderful location as well. We walked every square inch of the private beach. WE HAVE BEEN COMING TO THE CASTLE IN THE SAND FOR THE PAST 4 OCTOBERS TO CELEBRATE THE MUSHROOM FESTIVAL AND HALLOWEEN...THE NEW OWNER HAS ADDED SOME NICE TOUCHES AND CONTINUES TO MAKE THIS HOME VERY COMFORTABLE... IT SUITS OUR FAMILY OF 12 VERY WELL AND WE RECOMMEND IT TO ONE AND ALL...OUR RENTAL COMPANY ALWAYS DIES A STELLAR JOB OF MAKING OUR STAY MEMORABLE..
We had a wonderful time with family. overall the place was very nice and had plenty of room for all of us. you could see the ocean from the back deck and there was a nice path to the water. there were a few things wrong when we arrived, however management was very responsive. We rented this house over the new year's holiday. The proximity to the beach is the best thing about it. The house itself was fine, but the nightly rate warrants some updates. The dial on the washer upstairs is broken and wouldn't turn (not usually necessary for us, but the weather was wet and muddy). Carpet tacks in the living room are also sticking up, and the appliances are on the older side. Overall, it served our needs, but might be a better rental in the summer months, when you don't spend so much time inside and have access to the pool. Holiday are at the maximum rates. Rates do not include Taxes, Cleaning Fee, or any other fee that Applies. Please inquire for accurate Quote.